Unfortunately, our growing line for the Stevenote has been split up. IDG has decided to split the line this year between Platinum and Super Pass owners and “general users”. The Platinum and Super Pass holders line up down 4th Street, where last years line was while the “general users” line up down Howard Street. This should prove interesting. Pictures are coming soon, I promise! Guess what? Sidney and I are first in line for the Keynote. We have been in line since approximately 10 AM. We were recently joined by a third person, who is unsure if he will stay the entirety of the night (depending on if we can get power). We were just talking with Justine from iJustine.tv and a few other people amazed that we were lining up almost 24 hours in advance. 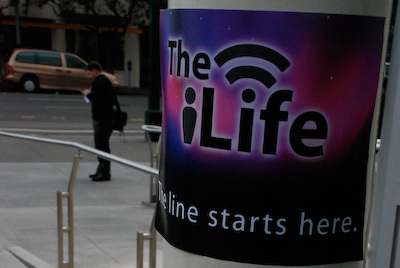 We are going to be doing a live show for theDigitallifestyle.tv from the line at 9PM EST (6PM PST). We are working on video and some more pictures, so watch for them coming your way. It is January 14th, and I am in inside Moscone West. 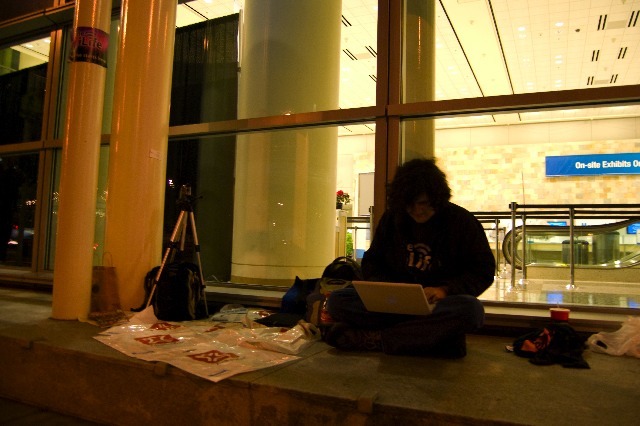 Sindey is currently outside waiting for the keynote, first in line and I will shortly join him after my conference. Keep checking the AJAX app for the latest. Photos after the jump. Macworld 2008 is almost here! Sign up for SMS alerts of the more urgent Keynote happenings here! With Macworld slowly dawning upon us, everyone is eager to know what Steve Jobs has up his sleeve. In fact, we are so eager that we traveled 2,904 miles to see it. Thats right- something is in the air. We will be providing live coverage from Macworld, starting tomorrow at about 8AM PST- but remind your fingers that the server will do all the refreshing for you- thats right, AJAX! For now, however, you can check out these pictures we obtained today, which involved getting kicked out of both Moscone Centers. Feel free to visit the AJAX app here. Photos after the jump.